Namaste Mari: NO MORE ROBIN EGGS! 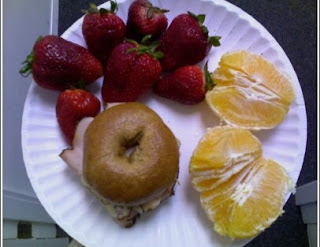 Ayer for lunch I had 100 calorie WW bagel with Swiss cheese and Pastrami seasoned Turkey, an orange, and strawberries. My boss sent me home early ayer because I pretty much sounded like crap. I ended up running some errands aka shopping lol. I went to Toys r us to buy some Play Dough for my niece since she is coming over to my house mañana and wants to create a sculpture =) lol...I also brought that cute thing that you stick the Play Dough in and squeeze it out into different shapes. Am I the only one that loves the smell of Play Dough???? Before bed I did 30 minutes of cardio, 100 sit ups and stretch and burned a total of 345 calories. 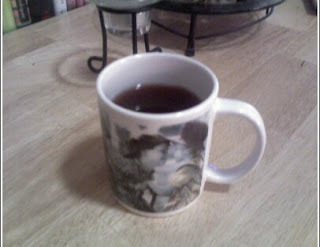 After my workout I relaxed with some tea while I watched Biggest Loser. This morning I woke up and tried to workout but I could barely breathe so I had to stop after 30 minutes of No More Trouble Zone DVD and burned 264 calories. 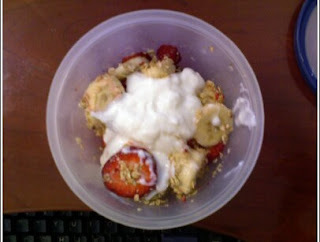 For Bfast I am having a banana and strawberries with Dannon ff activia and Kashi granola. Do you guys have allergies? If so, what do you take for it? I love the smell of play-doh too, haha! Eek! Hope you are feeling better this morning! I get that way with desserts too- sometimes they just have to go! 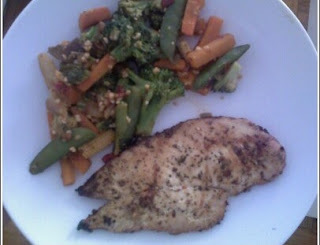 Your dinna looks really good at 8:30 this morning! Sorry I have no allergy cures! Hope you fell better. Awh, hope you feel better! Allergies are no fun. haha I love Robins Eggs too! YUM!!! I don't have allergies, but I just read an article that HONEY is great for curing allergies. maybe you can try that!